Affordable and exciting travel on the Plains of Camdeboo and beyond. The Eastern Cape Karoo region, also known as the Karoo Heartland, is the perfect destination for the adventurous and curious road tripper. Above all, it’s deliciously quirky and friendly out here. We have wondrous apparitions and encounters around every corner, as featured in Road Tripper Eastern Cape Karoo, your cubby-hole companion to the most enjoyable and affordable travel route in South Africa. Your journey starts here – Die Tuishuise in Cradock. Easily the finest Victorian-era Karoo restoration this side of Matjiesfontein, Die Tuishuise & Victoria Manor is a lovingly maintained set of candy-stripe cottages and an elegant old hotel in Market Street. The grave of Dr Koettlitz, legendary Polar explorer. 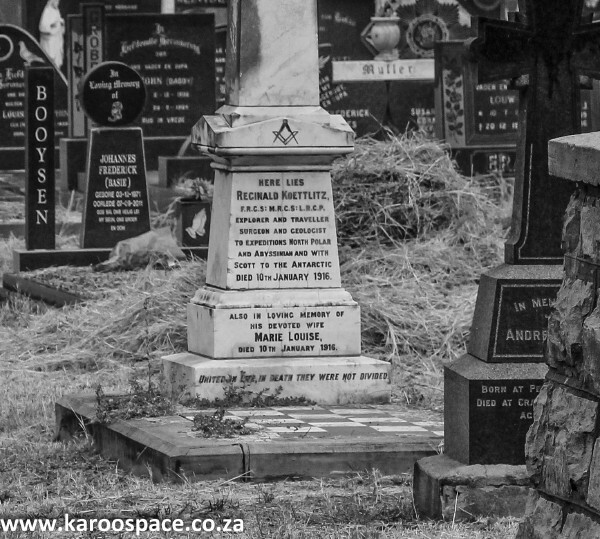 Dr Reginald Koettlitz and his wife, Marie Louise lie in the Cradock cemetery. He died on January 10, 1916, and Mrs Koettlitz expired a scant two hours after him. “An explorer and traveller, surgeon and geologist to Expeditions North Polar and Abyssinia and with Scott to the Antarctic.” Enough said. The prize possession of the Cradock Club. 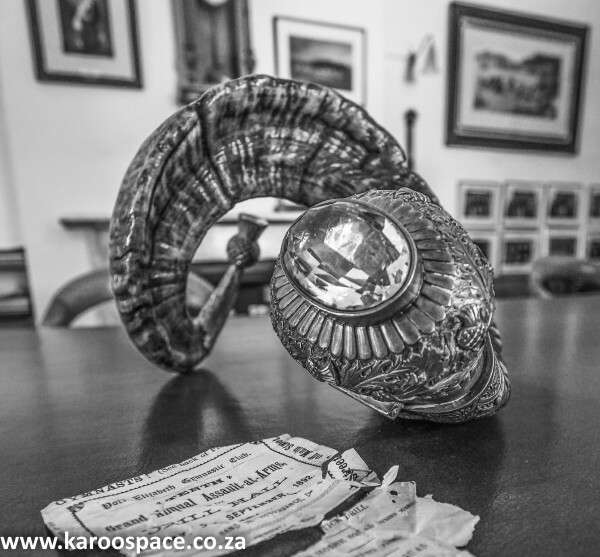 One of the most treasured items in the Cradock Club is a Scottish Highland sheep’s horn. It is generously studded with silver and amethyst crystals and once contained a large dollop of really sneezy stuff. This snuff horn was donated to the club by the departing Sherwood Foresters Regiment after the Anglo-Boer War in 1901. 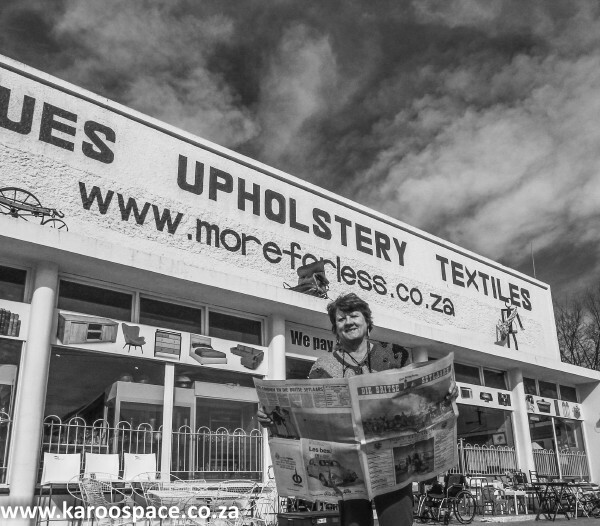 Marlene van Nuwenhuys, owner of More4Less in Cradock. More4Less, not 100 metres west of the Cradock Moederkerk, is the town’s mystery treasure chest. Here you can find anything from an electric guitar to a jaffle-iron, a snuff box to a stop watch and any other pre-loved object you care to mention. “My whole shop is an adventure!” owner Marlene van Nuwenhuys will tell you. Ganora Guest Farm – gold standard in local agri-tourism. 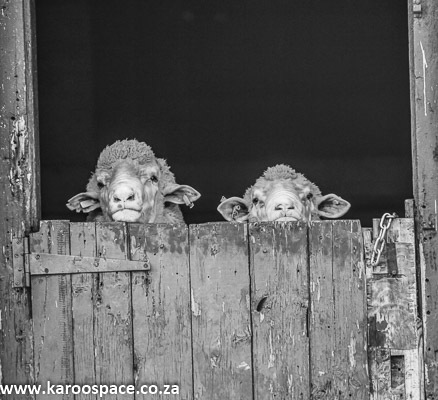 Once you’ve stayed with Hester and JP Steynberg on Ganora Guest Farm, it’s almost a guarantee that you will have fallen in love with the concept of a Karoo farmstay. 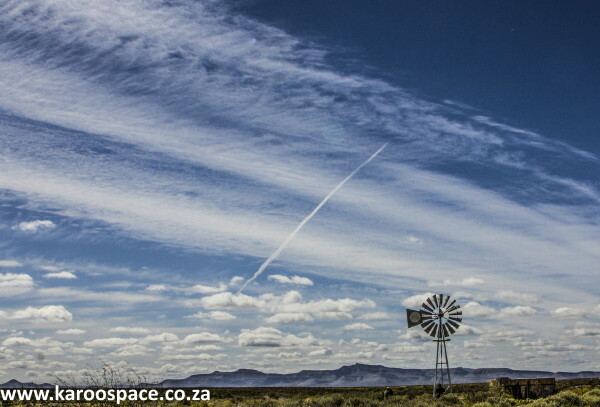 Agri-tourism in the Karoo Heartland is vibrant, and ticks all the boxes for the modern-day traveller. Serving wenches at The Camel Yard (Owl House) in Nieu-Bethesda. 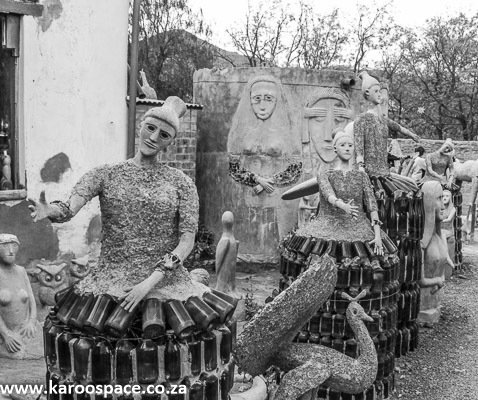 The Owl House & Camel Yard is a must-see for the first-timer to this little mountain village in the Sneeuberge. 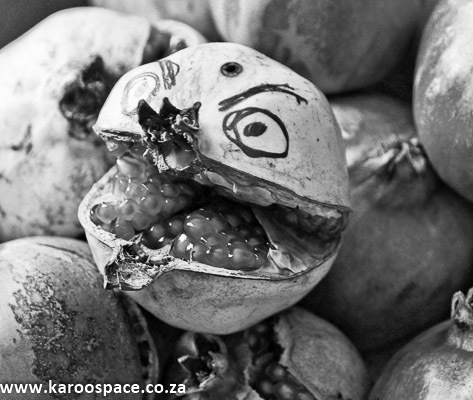 One question remains: why does the Karoo Heartland not have a fantastic Pomegranate Festival? After all, we celebrate garlic, pumpkins, writers and foodies with festivals – why not the super-healthy, goes-with-everything pomegranate? Look out all along your route for these wondrous fruits in late summer (late February to April) growing in just about every back yard you come across. 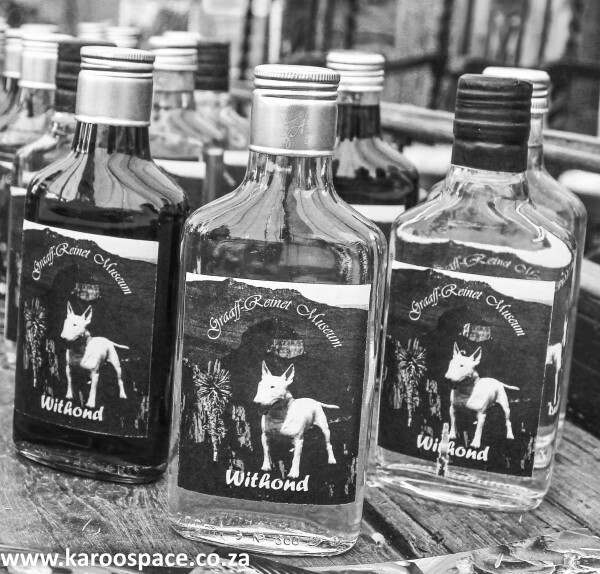 Witblitz on sale in Graaff-Reinet. 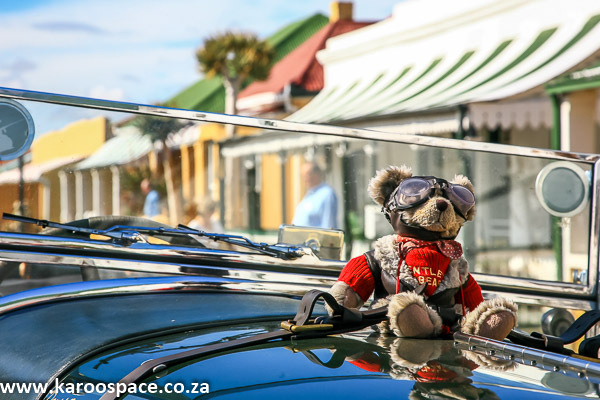 There was a time when Graaff-Reinet was a serious drinker’s town, what with a thriving wine and brandy industry amidst thousands of thirsty frontier people. There was also a moonshiner’s special called Withond that would sort the men out from the sheep – and amazlingly, it’s still on sale at the Reinet House Museum. One of the gargoyles on the roof of the local post office in Aberdeen. 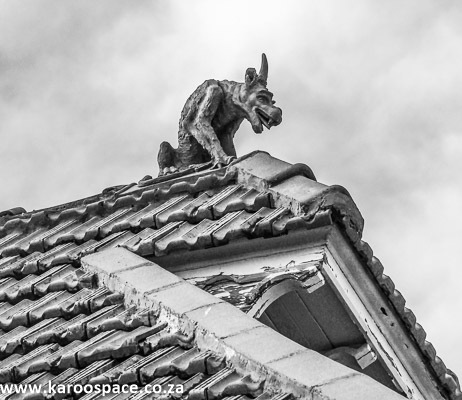 The only known griffins, gargoyles or terracotta dragons in the whole Karoo sit crouched on the roof of the old post office in Aberdeen. Legend has it that the building was originally meant to have been the magistrate’s court in Grahamstown, back east in Settler country. The popular ‘car bar’ in Steytlerville. 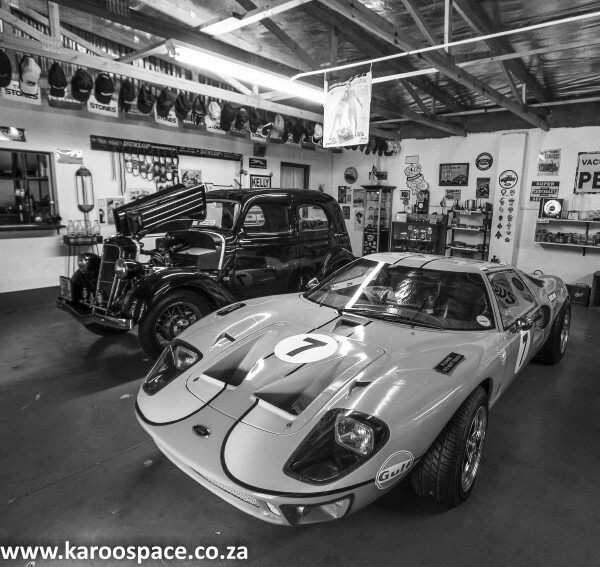 On the main street of Steytlerville you will find a typical Karoo traveller’s treat for petrol heads: a Willy’s Jeep, a Fairlane, an Opel Manta, an Anglia, an old racing car and a venerable 1937 Model C Ford, all in one lovingly-curated collection. Need a traveller’s guide book to this region: Here’s the Ebook Version for your tablet – and here’s the Printed Version for your cubby-hole. Are you referring to a GT-40 as “an old racing car”? Well, it was raced at the Scribante track in PE, if my notes are right. You know these cars? No more than any other old petrolhead. I’ve fracced wells since 1973 & driven V8s since 1974 – got to use up that extra production. Ford were rebuffed when trying to buy Ferrari, even with the marital link, so developed the GT-40, named for being 40 inches high, to beat Ferrari at Le Mans. Started with the same engine as the Fairlane mentioned above, but worked on a “bit” in the UK. Three GT-40s collided with each other, wasting several millions, but the win was the win. They were designed and built to win at Le Mans 24hr race. The first batch had 4 or 5 litre engines but weren’t reliable enough. So the following year they entered three cars all with seven litre engines and won. This was Henry Ford’s dream, to beat Ferrari at Le Mans. When American Dan Gurney raced one the team had to fashion a bulge in the roof for his head, because he was quite tall. In sports car racing history this car is a legend. If that car is a genuine GT40 and not an SA built replica, of which there are quite a few, it is literally worth millions.